The PowerVac™ is easy-to-install and deck-driven, featuring a trash-ingesting steel impeller that: chops and compacts most items without clogging or bridging; removes wet leaves and pine straw; collects grass clippings; and removes debris left behind by storms. The system propels debris into the large-capacity collector, which is rear-mounted to maintain zero-turn maneuverability and maximum visibility. 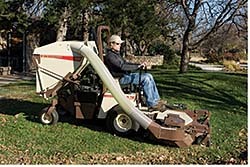 Tapered collectors compact debris for non-stop mowing and collection.